Don’t fight with ill-fitting or wrong size liners again. Curb Side Receptacle liners are specifically designed to fit the Rubbermaid® 50, 65 and 95 gallon Brute® Roll Out receptacle or equivalent. They are manufactured from linear low density polyethylene for strength and flexibility. The 2 mil thickness is cost-effective and tough enough for the heaviest applications. 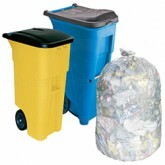 Curb Side Receptacle liners are available in clear for general refuse and material handling.